Lamina: Particle #1-4; artist-made paper pulptypes from pigmented cotton, abaca & cornhusk, 8.5"x 11" each, 2016-2018. Lamina: Particle (detail) artist-made paper pulptype from pigmented cotton, abaca & cornhusk, 8.5"x 11", 2016-2018. 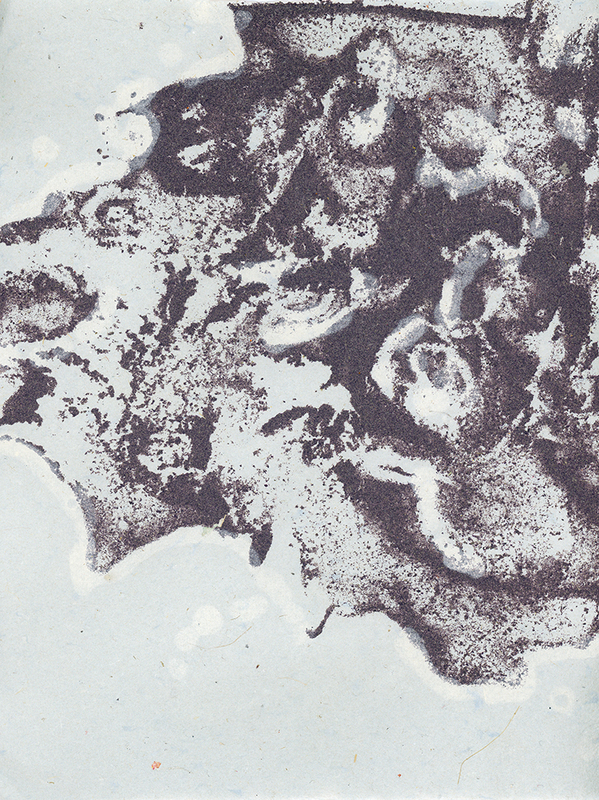 Lamina: Particle (detail), artist-made paper pulptype from pigmented cotton, abaca & cornhusk, 8.5"x 11", 2016-2018. Lamina: Particle (detail), artist-made paper pulptypes from pigmented cotton, abaca & cornhusk, 8.5"x 11",, 2016-2018. Lamina: Strata #1-4, laminated artist-made papers from pigmented cotton and abaca, 6"x 9" each, 2016-2018. Lamina: Stream #1-3, artist-made pulp paintings from pigmented flax, cotton and cornhusk, 6"x 9" each, 2016-2018. 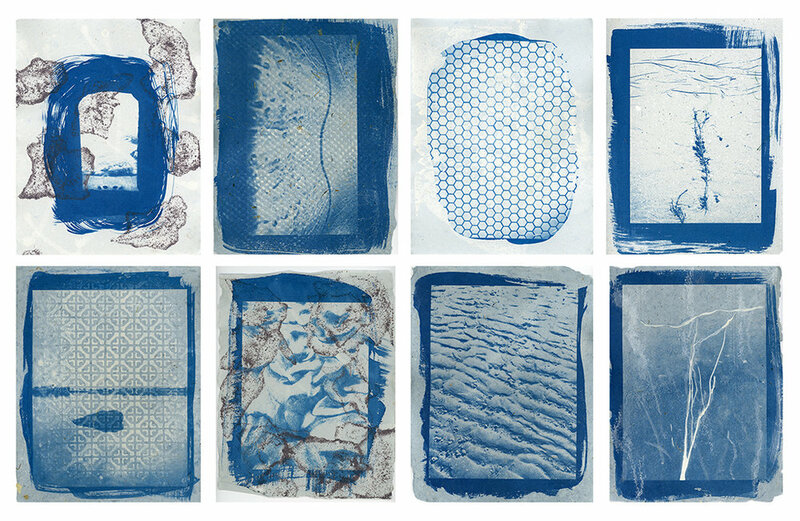 Lamina: Flow #1-4, laminated artist-made pulptypes from pigmented cotton & abaca with cyanotype, 6"x9" each, 2016-2018. Laminated: Eddy #1-4, artist-made pulp paintings from pigmented cotton, flax & cornhusk, with cyanotype and gauche, 6"x9" each, 2016-2018. Detail from "Lamina: Flow"; artist-made pulp paintings from pigmented cotton, flax & cornhusk, with cyanotype and gauche, 6"x 9" , 2016-2018.. Detail from "Lamina: Flow"; artist-made pulp paintings from pigmented cotton, flax & cornhusk, with cyanotype and gauche, 6"x 9" 2016-2018..
Lamina: Trace #1-8, cyanotype on artist-made pulp paintings from pigmented cotton, abaca & cornhusk, with gauche, 6"x9" each, 2016-2018. Detail from "Lamina: Trace"; cyanotype on artist-made pulp paintings from pigmented cotton, abaca & cornhusk, with gauche, 6"x9" , 2016-2018.. Detail from "Lamina: Trace";cyanotype on artist-made pulp paintings from pigmented cotton, abaca & cornhusk, with gauche, 6"x9", 2016-2018.. Detail from "Lamina: Trace"; cyanotype on artist-made pulp paintings from pigmented cotton, abaca & cornhusk, with gauche, 6"x9", 2016-2018..
Lamina: Drift: #1-10, cyanotypes on artist-made cotton & cornhusk paper, 8.5"x 11", 2016-2018. 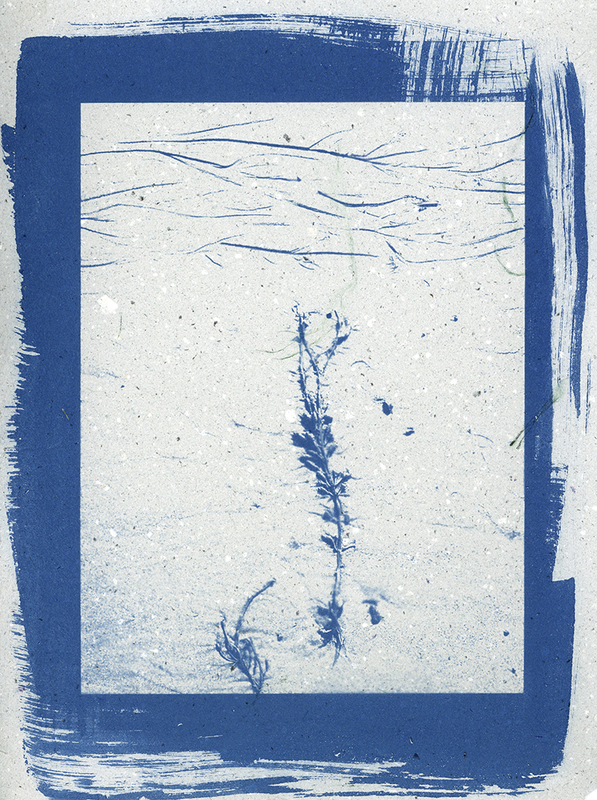 Detail from "Lamina: Drift"; cyanotype on artist-made cotton & cornhusk paper, 8.5"x 11", 2016-2018.. 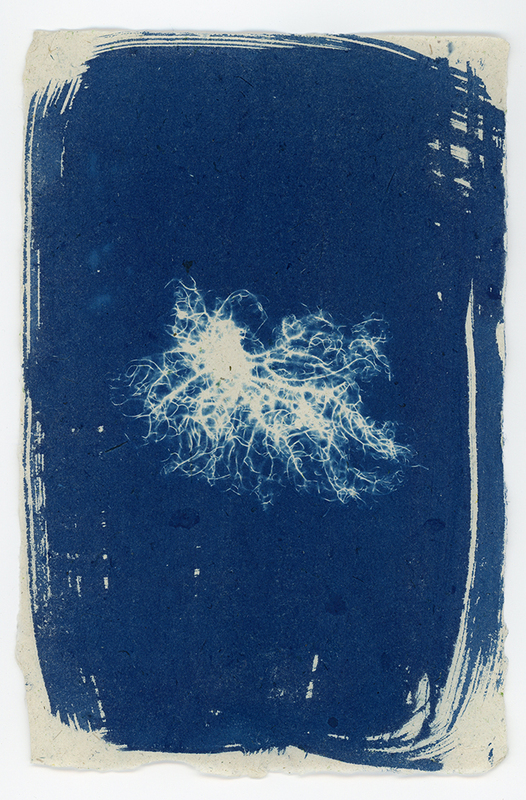 Detail from "Lamina: Drift"; cyanotypes on artist-made cotton & cornhusk paper, 8.5"x 11" 2016-2018..
Lamina: Undertow #1-8, cyanotype on artist-made paper from pigmented cotton & cornhusk with gauche, 8.5"x 11" each, 2016-2018.. Detail from "Lamina: Undertow";cyanotype on artist-made paper from pigmented cotton & cornhusk with gauche , 8"x 11",2016-2018.. 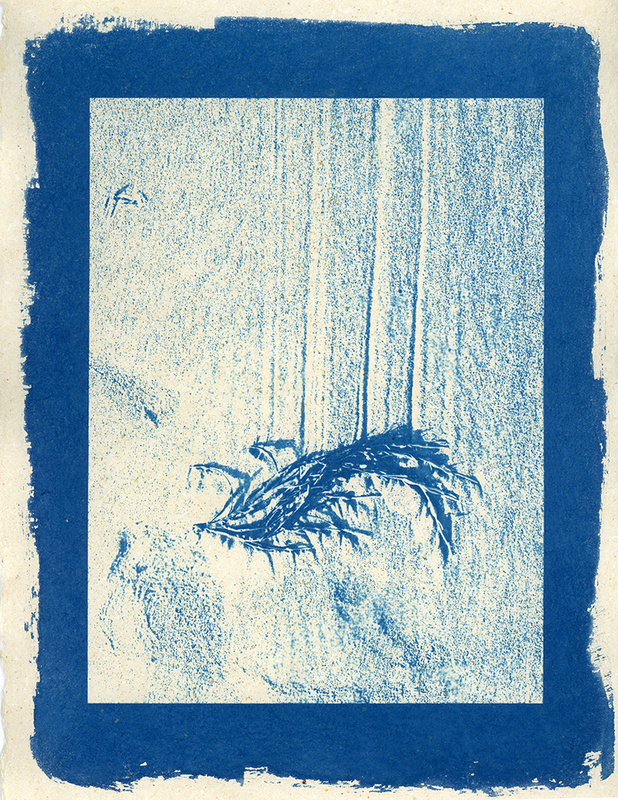 Detail from "Lamina: Undertow"; cyanotype on artist-made paper from pigmented cotton & cornhusk with gauche, 8.5"x 11",2016-2018..